Some patients are well enough to discharge straight home from the hospital. These patients are typically not back to their "usual selves" upon discharge and are still in the continuum of recovery. There are some programs available to assist the transition home. Eligibility for these Department of Public Health programs varies on a case by case basis. Home services can include: home attendant care, home nursing services, home rehabilitation services, out-patient rehabilitation services, and adult day care. Some patients qualify for transportation services to and from their appointments. The average stay in acute rehabilitation is two to three weeks long. This is for patients who were high functioning prior to their injury. Patients must be able to follow 90% of commands consistently and must be able to tolerate two to three hours of combined rehabilitation in a day. Patients must require physical therapy and at least one other rehab discipline such as occupational and/or speech therapies. Patients must have a viable discharge plan for after rehab, meaning they must have a place to go with some level of supervision (possibly twenty-four hour supervision). Stairs can also be a barrier. At acute rehab, families can expect a rigorous level of rehab at which patients are put on a regular schedule. All efforts are made to get a patient back to being able to do what he/she can for him/herself. There will be a dedicated team at the rehab facility who work with the patient and family to make all arrangements for the patient to discharge back to the community. The average stay in SNF Rehab can be any less than two months. This is either for patients who had some degree of disability prior to their most recent injury, for patients who are doing well but aren't quite ready to go back to their community situation or for patients who aren't yet doing enough to be an acute rehab candidate. Patients must be able to follow 75% of commands and must be able to tolerate one to two hours of combined rehab in one day. Having a viable discharge plan is important but doesn't always preclude placement (it depends upon the facility). 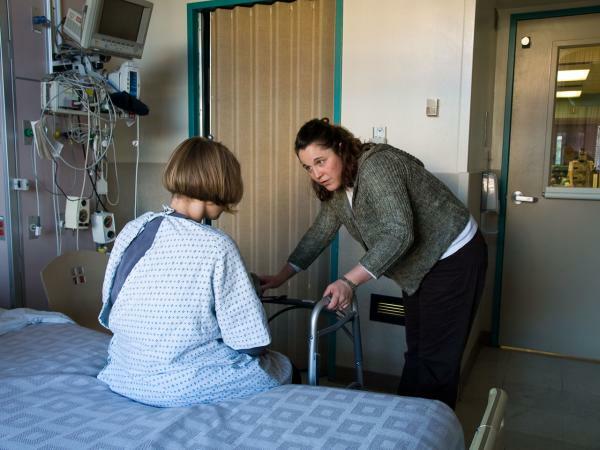 Patients take part in a scheduled form of rehabilitation with the goal of getting them either back home, to a board and care or on to acute rehab. SNF stands for Skilled Nursing Facility-other words for this same level of care include: a nursing home or a convalescent center. This is the type of care that is for patients who need a longer form of care-anything longer than two months. Skilled needs for this level of care include: a feeding tube and/or rehabilitation services. Patients can receive rehabilitation services at this level of care but only if they are actively participating and making gains. A patient becomes "custodial" when they don't have any skilled needs but require twenty-four hour care and can't go back to the community. Patients can stay in this level of care for their lifetimes. This is a special category of care in California. It is a higher level of care with a different type of license than a regular skilled nursing facility. This level of care is for patients who are on a ventilator or have a tracheostomy tube and a feeding tube. The purpose of these facilities is to wean patients off of their trachs, if possible, and to transition them on to either rehabilitation or to a long term care facility. Some patients do get stuck at this level of care for some time. There is a shortage of this level of care in Northern California, so most patient skip this level of care and get their trachs out in the acute care center before moving on to the next level of care.